Narrow Gauge Railroads of Oregon. Dayton, Sheridan & Grand Ronde Railway. 36" Gauge. Organized in 1877 by farmers from Bellevue, Dallas, Perrydale, Sheridan, and Willamina to build a railroad that would serve their towns. The railroad constructed twenty miles of tracks on the Yamhill and South Yamhill rivers between Sheridan in the west and Dayton to the east before entering recievership. The line and it's debt was purchased by a group of Scottish capitalists to become part of the Oregonian Railway. 36" Gauge. William Reid and a group of Scottish capitalists formed the Oregonian Railway Company Ltd. after purchasing the bankrupt Dayton, Sheridan & Grande Ronde railroad in 1879. Henry Villard of the Oregon Railway & Navigation Co. was granted a long-term lease to operate the line in 1881. In 1884 Villard left the OR&N and the company terminated the lease, forcing the Oregonian into receivership. The Southern Pacific Railroad gained control in 1890 and standard gauged the line by 1893. 36" Gauge. Originally constructed as a broad gauge railway. It later became part of the Oregon Railway & Navigation Co. in 1880. In 1891 the line was reconstructed by the Oregon Portage Commissioners to meet the demand of riverboat traffic halted at Cascade during the construction of Cascade Locks. 36" gauge was selected to match the Army Corps of Engineers construction railroad. Portland & Willamette Valley Railway. 36" Gauge. Incorporated by the Oregon Land & Investment Co. as a steam dummy line from East Portland to their ferry terminal on Hayden Island. The line became part of the Multnomah Street Railway in 1892 and converted to 42” gauge. In late 1892 the Multnomah Street Railway became part of Portland Consolidated Street Railways. 36" Gauge. Incorporated in 1890, the narrow gauge railway's initial purpose was to haul logs to a sawmill in South Baker City. By 1891, the line had reached McEwen, 22 miles west of Baker City, and the railroad began offering passenger and freight service. 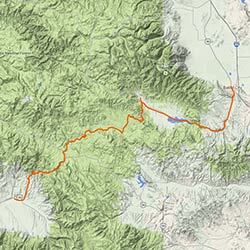 It reached Sumpter in 1896 and continued southwestward to Whitney, Tipton, Austin and Bates. By 1910, it arrived in Prairie City, a ranching and mining community along the John Day River in Grant County. 36" Gauge. Operated a mill and short railroad from Leland Station on the Southern Pacific to the mill. Addtional track ran further into the woods, to a maximum length of 1.5 miles. The mill ceased operation in 1926. 36" Gauge. Established by J. O. Goldthwaith when he purchased a sawmill, built in 1916 by Wilbur Knapp, on the Williamson River, one mile north of Chiloquin OR. Reorganized around 1923 to become the Modoc Pine Lumber Co. After fire destroyed the mill in May 1925, the line was sold to Forest Lumber of Kansas City who rebuilt the mill and standard gauge operation. Near Chiloquin, Klamath County. Narrow gauge 1918-1925 - Standard gauge 1923 to 1939. 42" Gauge. Organized in 1901 from the assets of the Star Logging and Lumber Company. The Yeon and Pelton logged the rugged hills south and west of Rainier, Oregon. In 1906 the company became part of the Portland Lumber Company, and later the Noyes-Holland Logging Company. Operations ceased in 1919 when the timberland was depleted. Oswego Iron Company / Oregon Iron and Steel Company. 36" Gauge. Built to service the Oswego furnace and connect the Prosser Iron Mine 2.6 miles distant. The financial panic of 1893 caused the price of pig iron to drop, making the company unprofitable. The furnace closed down in February 1894, the rail line to the mine was eventually taken up in 1910. Portland, Mt. Tabor & Eastern Railway Co.
42" Gauge. Built by local residents to extend service beyond the City Suburban Railway’s line to Mt. Tabor. The line operated briefly before the 1893 recession affected their passenger traffic. Their operating agreement with the City Suburban Ry was not renewed and the line was scrapped in 1894. 42" Gauge. Incorporated by the Willamette Iron Bridge Company to operate a horse drawn streetcar line across the Willamette River bridge. They also operated two steam dummy lines, the first from 5th street along Morrison St to the Mt Tabor Park. The company merged with the Transcontinental Street Railway in 1891, becoming the City & Suburban Railway.